Manchester City Women boss Nick Cushing says it is "realistic" for England's top clubs to attract crowds to compete with the attendances seen at Atletico Madrid and Juventus. 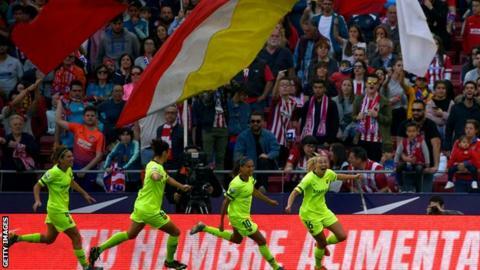 A European record of 60,739 watched Barcelona beat Atletico on 17 March. A week later, 39,000 were at the Allianz Stadium to see Juventus beat Fiorentina. But Cushing says England's top-flight sides need to widen their supporter base if they are going to compete. The largest English crowd in the modern era was 45,423 for last season's FA Cup final between Chelsea and Arsenal. Cushing, 34, told the BBC: "The FA Cup final crowd weren't just fans of the clubs involved. There were a lot of general fans of women's football as well. "At Atletico Madrid and Juventus, the crowds were driven by the fans of the clubs involved. "That has to be our aim as well and we feel it is realistic." During the 2012 Olympics, 70,504 were at Wembley to see Great Britain beat Brazil 1-0. Chelsea Women have the highest average crowd in the WSL this season with 1,965, followed by City with 1,607. Cushing was speaking before City's Women's Super League game against Liverpool at the City Football Academy on Sunday. City are a point behind leaders Arsenal with three games remaining, although the London side also have a match in hand. At the very worst Cushing's side are on course for their fourth successive top-two finish, having already won the Continental Cup and reached the semi-finals of the FA Cup, where they will play Chelsea on 14 April. "We are working hard to grow the game and grow each part of Manchester City," said Cushing. "What we try to do is put a product on the pitch that encourages supporters from the men's team to come and watch us too. "We wear the same kit. It has the same badge on it and we have the same passion and desire to be successful."